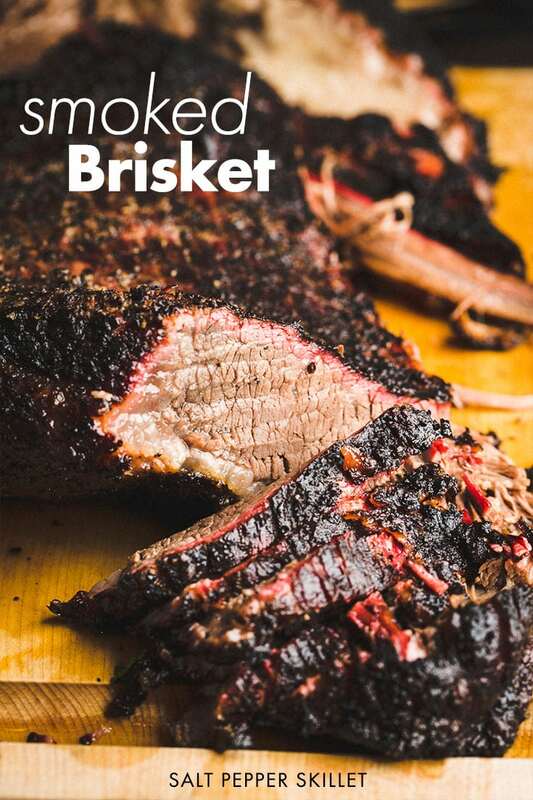 Pure and simple melt in your mouth and packed with flavor beef brisket seasoned with salt & pepper then smoked low and slow with post oak and apple wood. Smoking a brisket is an art. An art that seems super scientific and maybe impossible to master. 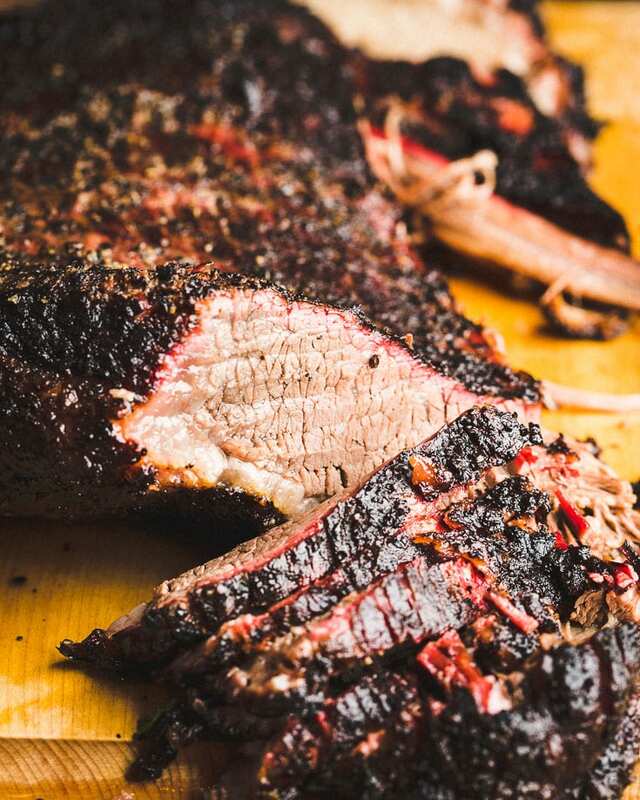 So let’s change that and break it down to be something super simple that you can make today and have it be the best brisket you have ever tasted. While we might never consider ourselves “pit masters,” being able to cook a pit master quality smoked brisket is something I guarantee that you can do if you follow the formula. We have a great Texas barbecue place really close by our neighborhood called Grand Ole BBQ y Asado. When you get within a few blocks, the smell from their trailer-sized smokers is unmistakable. They have some of the best barbecues in San Diego, and their brisket is top notch. As fun as it is going out to get great barbecue, there’s just something about putting in the labor yourself that makes it taste that much better. 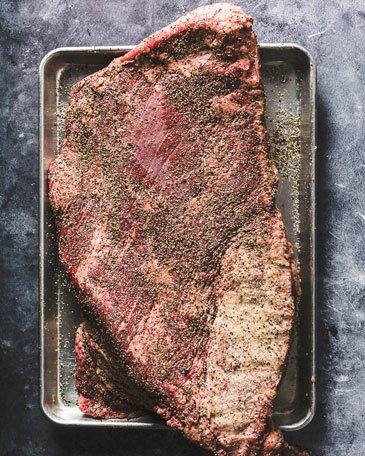 The formula for perfect brisket: Making a perfect brisket doesn’t require any secret ingredients or technique. It’s really just the combination of 5 things. When one or two of them are slightly off, your brisket will still come out great, so don’t stress too much. High-quality meat + basic seasoning + quality smoke + constant temperature + long rest. That’s all it takes. Use the highest quality meat (USDA Prime recommended). Use high-quality fuel, including lump charcoal and wood chunks. Manage the fire to maintain a constant temperature. A high-quality fuel + fire will help give the best smoke for your meat. Using a 2-Channel Thermometer (affiliate) makes this so much easier to do. Low and slow. This brisket is going to take a long time to cook, so be prepared and don’t ever rush it. The resting time is so important. It must rest for at least 1 hour and preferably 2 hours to fully re-absorbe all those juices. Whether you are using a Traeger, a Big Green Egg, or a box smoker; it’s really the same concept. As long as you can maintain the proper temperature, deliver quality smoke and let your brisket rest for at least 1 hour; your brisket is going to come out great. 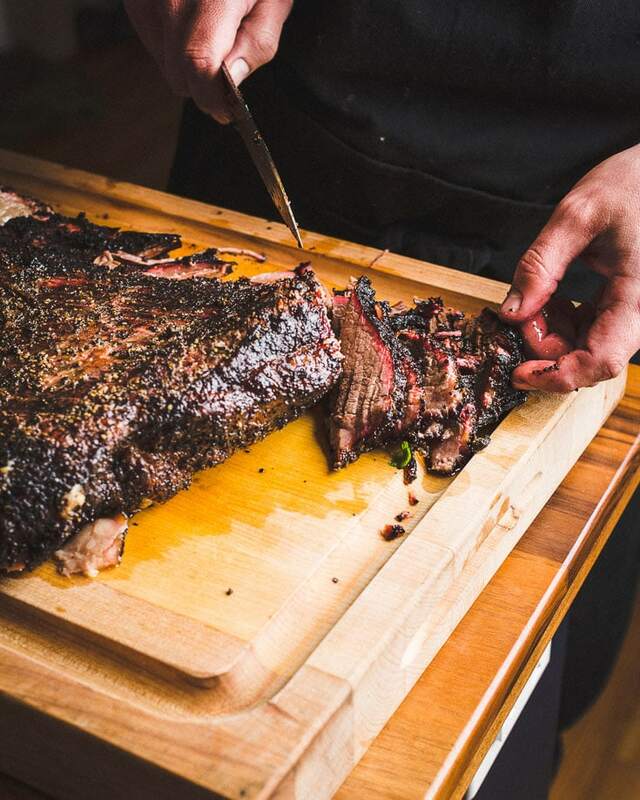 Don’t calculate your hourly rate into this, but you can feed about 25 people with a 14-pound brisket. At $3.50 per pound, that is less than $2 per person for some of the best barbecue meat they will ever taste. Pretty amazing, right? 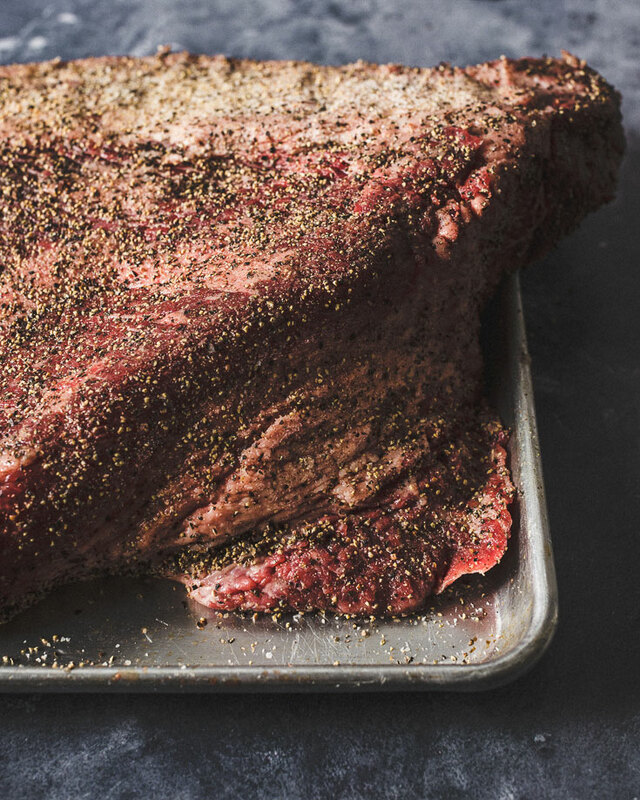 What you are going to need to make the most amazing brisket. Contains affiliate links where I will receive a commission if you make a purchase, at no extra cost to you. Lump charcoal (if using a charcoal grill). I recommend the Big Green Egg all-natural lump charcoal, and yes it is better than others I have tested. Wood Chunks for long smokes: I recommend a combination of Post Oak and Apple wood chunks for brisket. Don’t use small wood chips because they will burn up too quickly for this long cook. Disposable Aluminum Drip Pan to catch the fat drippings and for a water bath to keep the smoking environment moist. You can buy these in bulk at Costco. Thermoworks Two zone thermometer is an essential tool for smoking that monitors the temperature of your smoker along with the internal temperature of the meat. It will remotely alarm you if a temperature of either goes outside the parameters you set. 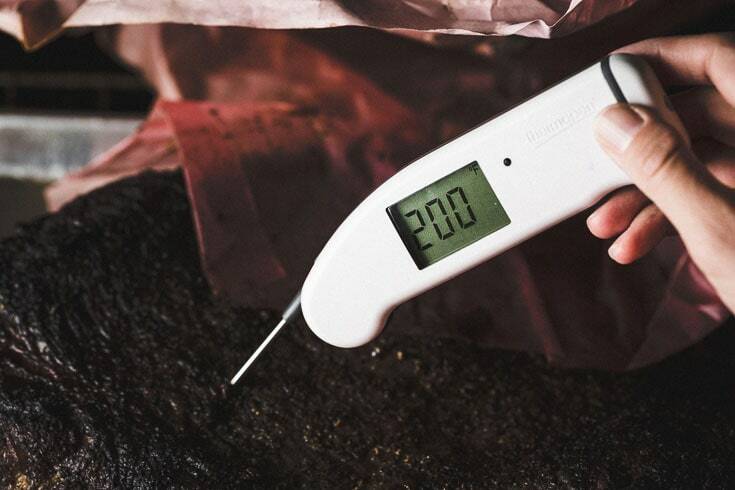 Thermapen instant-read thermometer gives you precise internal temperature reads of the brisket. Long Tongs for transferring the brisket to and from the smoker. Boos Block Cutting board for prepping and slicing the brisket. Sheet Pan for seasoning the brisket and bringing it out to the smoker. Butcher paper for wrapping the brisket after it reaches 165 degrees to finish the cook. Boning knife for trimming the fat and silver skin off the brisket. Cooler for resting the brisket in an insulated environment after the smoke. It’s always a good idea to pre-read a recipe before you even start. 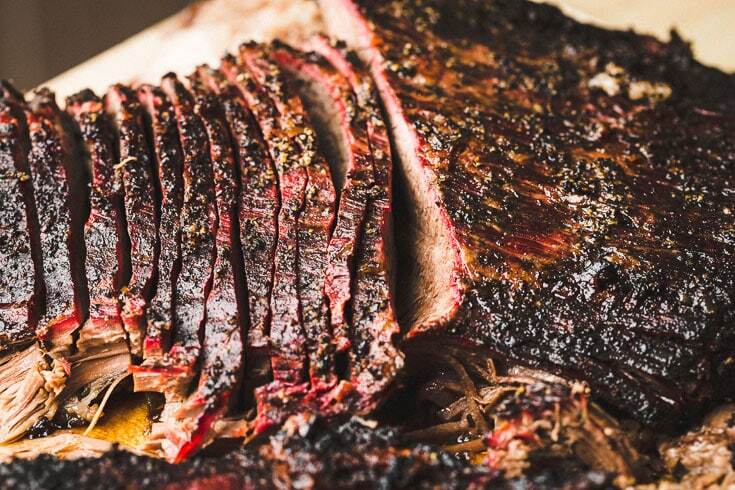 Here are the basic high-level steps to make the best smoked brisket. The full recipe is towards the bottom of this post. Trim excess fat down to 1/4”, then season the brisket with a 50/50 mixture of kosher salt and freshly ground black pepper. Let it sit at room temperature for 1 hour. Prep your smoker to use indirect heat and bring the temperature to 250° F with a combination of Post Oak and Apple smoking chunks (or your preferred type of wood) to start the smoke. Place the brisket in the smoker over indirect heat with the tip (thicker part of the meat) closest to the heat source. Smoke until the internal temperature reaches 165° F.
Wrap the brisket tightly in uncoated butcher paper, then back in the smoker until the internal temperature reaches between 200° and 205° F.
Rest between 1 to 2 hours in a cooler before slicing and eating. 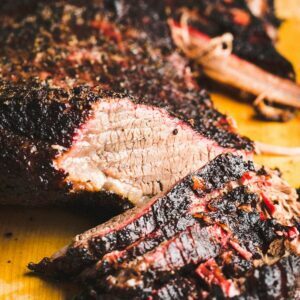 What type of brisket meat is best for smoking? I always recommend going with USDA Prime Grade brisket. It is usually only a few dollars more per pound, and totally worth it. The internal marbling is far superior to lower grades of beef. Marbling means more fat and more flavor and a much tastier and tender brisket. If you can’t find Prime grade, then go with choice grade at a minimum. If you are using pasture grass-raised beef, then your cooking time will be less because these cows are often leaner. It’s important to trim a lot of the excess fat from the brisket as it doesn’t provide any benefit. There is plenty of fat marbled in the meat already. Trim the top fat side down to about 1/4” of fat layer. You also want to remove the silver skin (sinew), as it doesn’t break down and tenderize no matter how long it cooks. It’s really up to you as to how much time you want to spend trimming the brisket. Trim the fat when the brisket is very cold. It will make it much easier to slice through the fat than when it is at room temperature. Either trim it when it’s right out of the refrigerator or you can even place it in the freezer for 10 to 15 minutes to really chill it down before trimming. Dry the brisket off with paper towels before trimming. Use a very sharp knife when trimming the brisket. Using a dull knife will make the task way harder than it needs to be. A flexible boning knife will allow you to easily maneuver and avoid taking off any of the brisket’s flesh. Don’t go overboard. You can spend as much or as little time as you want. Ask your butcher to do it for you if it’s something you if you don’t want to do it yourself. Avoid trimming the brisket all together by buying one that is already trimmed. Some briskets come already trimmed, which saves a lot of time. A pre-trimmed brisket can also save you a lot of money because you aren’t buying fat that is just going to go in the trash. Smoking the flat vs the tip vs the whole brisket? It’s usually possible to buy either just the flat or the tip from your butcher. Smoking anything less than the whole brisket just isn’t worth it with all the time you will be investing. There’s no reason not to smoke a whole brisket, and it will give you a variety of different meats between the flat and the tip muscles with different textures and fat contents. We want to taste the beef and the smoke, so there’s no need to cover that up with a strong rub or marinade. You can totally go crazy with your favorite special rub if you want to. With this recipe, we’re keeping it super simple and only using an equal ratio of Kosher salt and freshly ground black pepper. 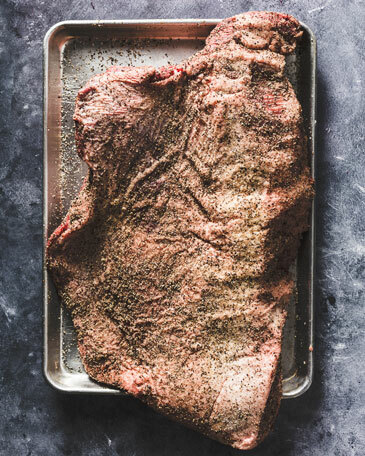 After the brisket is trimmed and dried well, combine the Kosher salt and pepper in a small bowl or a spice rub shaker and evenly sprinkle it all over the brisket. For this smoke, we are seasoning the brisket one hour before cooking. A 50/50 combination of Diamond Kosher salt and freshly ground black pepper. 1/2 cup of each is just about perfect for a 14 lb brisket. Any leftover seasoning can be used for seasoning the next thing you throw on the grill. Wood for smoking often comes down to preference and can require experimenting to see the flavors you love best. Type of wood: a combination of Post Oak and Apple Wood. Wood Size: For a long smoke like this one, use wood chunks which are much larger than chips and will last for hours instead of minutes so you don’t have to keep adding more. Smoker: 145° to 160° F (maintain 150° if possible). Brisket Internal temp #2 (finished cooking): 200 to 205° F.
A brisket is finished cooking when the internal temperature reaches between 200° and 205° F. While the time it takes to finish cooking can vary greatly depending on a lot of variables; there shouldn’t be any guessing as to when the brisket is finished cooking. Always use a Thermapen instant-read probe thermometer (affiliate) to check the temperature, and even better is to use a Thermoworks Smoke Alarm (affiliate) so you can monitor it wirelessly without having to open the smoker. This means it’s finished cooking, but it’s not ready to slice in to and eat. It still needs to rest for at least one hour and preferably two hours before slicing. Place the tip (thicker part of the brisket) closer to the heat source than the flat (thinner part). This helps the whole brisket cook more evenly. Depending on your smoker, you might want to rotate the brisket once or twice during the cook. I personally never move mine when using a Big Green Egg. It’s all about fire maintenance to maintain the fire and constant heat. If you maintain the constant temperature around 250 degrees, it will cook perfectly. Use a 2-channel thermometer (affiliate) to remotely monitor the temperature of the smoker and the internal temperature of the brisket. I can’t tell you how much this will help and limit the trips out to the smoker to make sure it’s still at the right temperature. OPEN THE LID AS LITTLE AS POSSIBLE! Keep that lid closed for as much of the smoking time as you can. When you do have to open it, do it quickly. This keeps the smoke in and maintains the temperature. 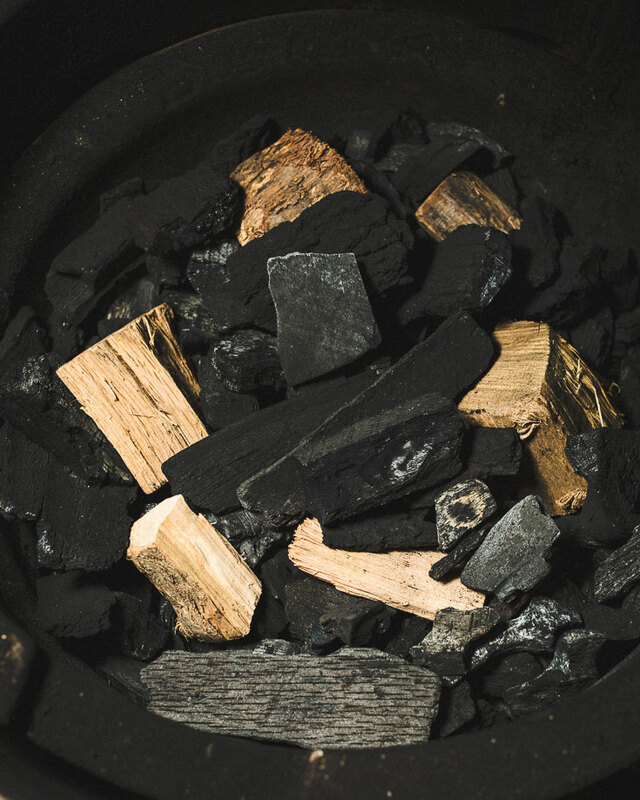 Use high-quality wood and charcoal. Know your cooker. 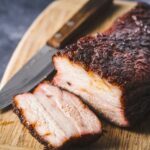 Knowing how your smoker works can take experience and trial and error, but it makes all the difference for being able to know how it is going to act and how to make changes to get the fire right. 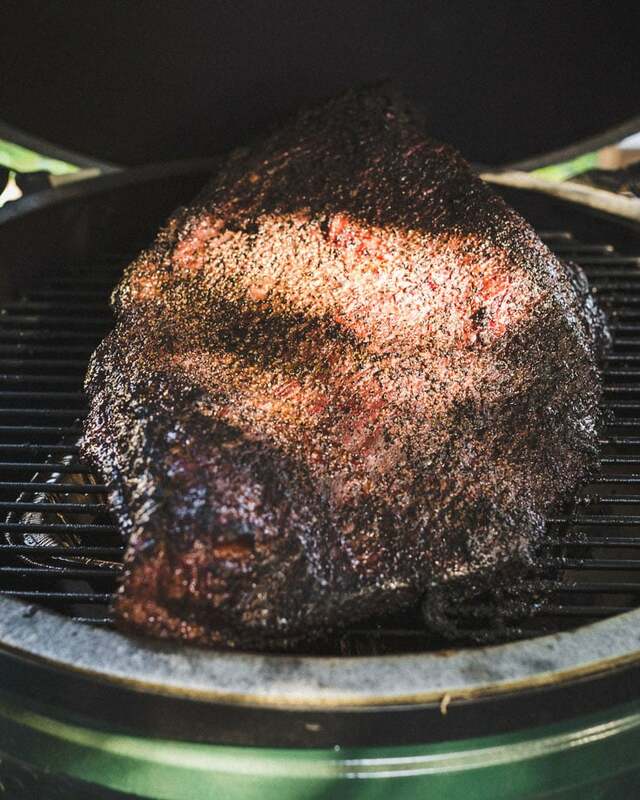 Use a water pan to keep the environment moist, which keeps the brisket from drying out. The pan will also catch the drippings. **The water can evaporate during the cook, so it’s important to check it a few times as you might need to add more. Use hot water in the water pan so the smoker doesn’t have to heat it up on its own. Take notes. Document how you set up your smoker, the type of wood you used, how much, the times and temperatures throughout the smoke, as well as the resting time. Smoking is an art and you will want to remember what worked and what didn’t with your particular setup so you can continue to get better each time. Fat side up or fat side down? The myth that fat side up will allow the fat to run through the meat has been busted numerous times. It just doesn’t work that way. I recommend placing the fat side closest to the heat source, which will protect the meat from drying out as well as make for the best bark. The stall when smoking meat happens after two or three hours when the internal temperature reaches around 150 degrees. It can stay at this temperature for up to four hours. The stall is real, and it can really mess with you. It messes with me every single time. You just have to know it’s going to happen and trust that yes, the temperature will rise again and it will rise fairly quickly once it starts. Rest the brisket for 1 to 2 hours in a cooler (still wrapped in the butcher paper). You can also wrap it in another layer of aluminum foil and a few towels to keep it extra insulated. It might be tempting to rest it for less time, but it’s totally worth waiting. This gives all of the juices time to fully redistribute and will result in juicier and more flavorful meat. 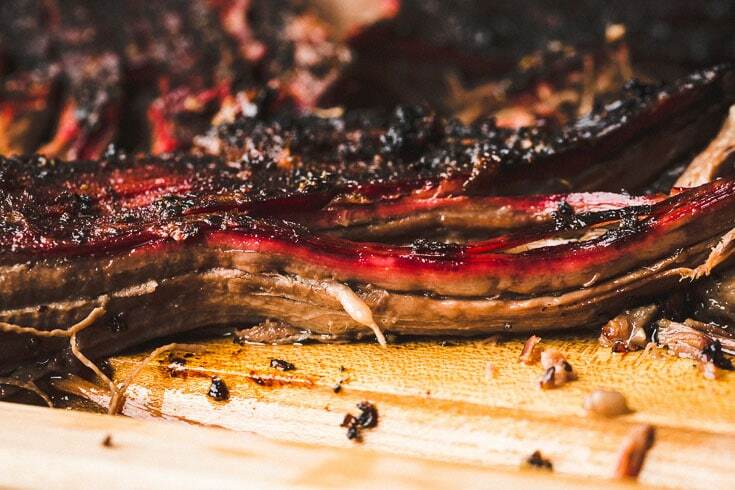 After the brisket has fully rested, of course you can’t wait to start eating. Don’t slice the brisket until it is fully rested. First, separate the tip from the flat. Separate the two muscles from each other, which is easy to do once the meat is cooked. Slice against the grain using long slice strokes into 1/4” thick slice. Sliced brisket will dry out fairly quickly after it is sliced, so just slice what you need and slice more as needed later. Use a long sharp slicing knife like the Victorinox 12 Inch Granton Blade Slicing or this Dexter 12-Inch Scalloped Roast Slicer Knife (affiliate links). Slice against the grain for the most tender slices. Serve it with bread, butter pickles and quick pickled onions. Bright sides that will contrast with the smoky flavorful meat with nothing too fatty or rich will be a great side. A fresh coleslaw is perfect because you can eat it on the side or put it on a brisket sandwich if you prefer. Funny thing that I found out with this brisket. 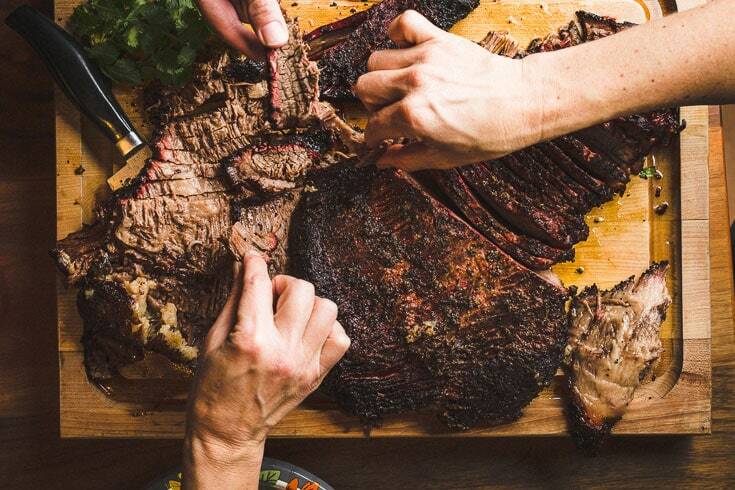 If you put the entire smoked brisket out on a cutting board, a crowd flocks and starts slicing little pieces and nibbling their way through the evening. This continues to happen as long as the brisket is out. This could take the place of a cheese board. Do you need bbq sauce with brisket? The quick answer is NO! BBQ sauce isn’t needed for something this rich and flavorful. It speaks for itself. If you need bbq sauce on your brisket, then chances are something went wrong when cooking it. This brisket should melt in your mouth with so much amazing flavor that you definitely don’t want to cover it up. But if you must, a little sauce can be added or on the side to dip in. So you smoked a whole brisket. Chances are there will be at least a little leftover (or at least I hope so for your sake). The good news is that there are so many things you can make with the leftover smoked brisket. The two things that I’m going to highly recommend that you make are brisket sandwiches and omg good brisket ragu over pasta. For the sandwiches; I will usually slice off pieces of the flat, microwave them for 30 seconds or so just so they are slightly warm, and put them on white bread with just a little sauce. Making a ragu with this brisket is just insane. I don’t have a recipe up here for it, but I followed similar steps to this bolognese sauce. It came out pretty much amazing. Make a smoked brisket ragu pasta, breakfast brisket and egg hash, tacos, brisket sandwiches, brisket grilled cheese, add it to baked beans, make chili, add it to ramen. Ok, you get the point. It is good in just about anything and you are the lucky one who gets to indulge for hopefully a few days at the least. It’s going to be a long and wonderful day smoking this brisket, so you need to stay hydrated and happy. Along with drinking plenty of water, a light session beer during the day does the trick. When it gets closer to eating time; switch over to a smoky cocktail when it’s time to eat. 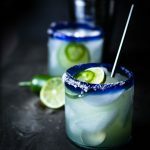 Mezcal Sour and the Hot and Smoky Mezcal Margarita are a great pairing. Combine the Kosher salt and freshly ground black pepper in a small bowl or spice shaker, then evenly season the brisket on all sides. Let the brisket sit out at room temperature for 1 hour. While the brisket comes to room temperature, prepare the smoker according to the manufacturer’s instructions for indirect cooking and add post oak and apple wood chunks for smoking. Bring the temperature to 250° F.
Place the brisket in the smoker with the tip closest to the heat and the fat side closest to the heat (up or down). Leave the lid closed for 4 to 5 hours until dark brown bark is formed and the internal temperature is 165° F. Don’t open the lid until this point unless absolutely necessary. Remove the brisket from the smoker and wrap it tightly in uncoated butcher paper. Place it back in the smoker and continue cooking until the internal temperature reaches between 200 and 205° F°, about 3 more hours. Carefully transfer the brisket (still wrapped in the butcher paper) to a cooler to rest for at least 1 to 2 hours before slicing it. You can wrap it in foil and a few towels to further insulate the brisket inside the cooler if you prefer. Separate the flat from the point. Slice against the grain into 1/4″ slices. The thicker part of the brisket (the point) should be closer to the heat source. You can use apple cider vinegar or whatever liquid you want to spray on the brisket during the smoke if burning or moisture is an issue. I personally do not do this. Don’t slice it until you are going to serve it or it will dry out. Good and thorough tips Justin! Hub’s brisket is almost there but we think the most recent one needed more rest time. I passed this article to him in case there are any other gotchas. 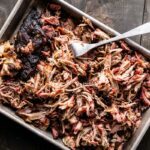 We have a smoked pulled pork and smoked bacon recipe on our site. I followed the recipe, some of the best brisket I have eaten. Also leftovers made killer sandwich’s and quesadillas. So glad you liked it! Totally agree that the leftovers make amazing sandwiches. I would give this six stars if possible. I couldn’t believe how flavorful this brisket was with just salt, pepper, and smoke! The point in particular comes out so soft and rich, full of melting fat and flavor. And thanks Justin for the impressively assiduous write up! Very easy to follow! This was mouth watering, melt in your mouth good!!! So good in fact we were dropping meat on the floor fighting over it!